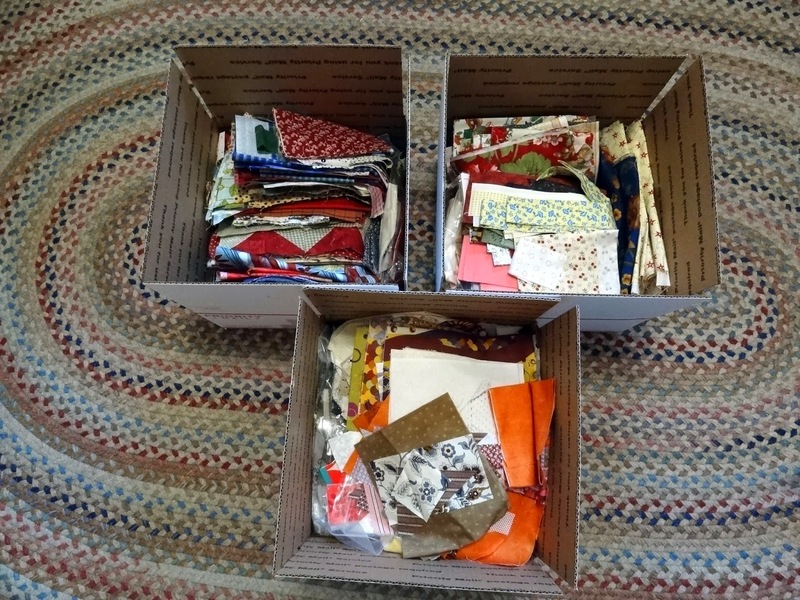 Squash House Quilts: Scraps, Anyone? You probably remember the scrap project I started a while back. I recently finished all 440 squares! It didn't even feel like it took that long. I tell you, I was really headstrong on this one. Even Mr. Squash was in awe of how much significant time I spent sewing these together! Here they all are sorted into light, medium, dark and red. Why red, you ask? As I constructed the blocks I knew in my mind there were a lot of reds. What I didn't realize is that there isn't a single wall in the Squash House big enough to hang the batting so I can lay them out. So, I decided to just randomly sew them together from the piles making sure to put an even amount of red in each row. Cross your fingers this harebrained scheme works! Here is a portion of the first row all sewn together. It's so long that the other portion is hanging from the back side of the door! So, this brings me to all those leftover scraps! I really don't want them anymore. Each piece now has two quilts made from it and that's enough for me. I want to start a new scrap bin, as crazy as that sounds! So, I'm offering each box for just the price of postage which is $17.95 Flat Rate Priority for the large box, stuffed to the brim. I can only offer this to U.S. residents. To sweeten the pot just a tad, there will be a surprise in each box - maybe a pattern or two, some orphan blocks or even a small kit. You need to take your chances on what might be in each box. I have three boxes now, but can fill at least two more. Wow - I had great response to getting my leftover scraps - they're all gone now! I can not wait to see this quilt all together. Amazing how simple blocks can give such a graphic look. I know how you feel about repeating projects with the same fabrics. I get tired of my own scraps and would be perfectly happy to paw through someone elses or start a new scrap bin! These are sure to get snapped up with unknown surprises inside. I would love a box of your scraps, but I don't have paypal. I could send you a money order. I would get it when I go to the doctor today if that will be okay. 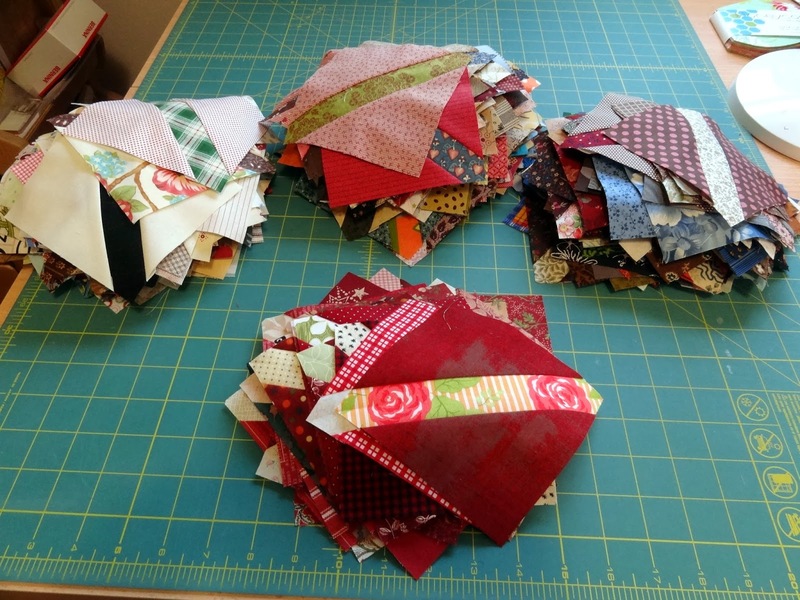 This is going to be an amazing scrap quilt, love all the red. Always enjoy someone else's scraps and I do have Paypal. I'm doing a hexie project and this would add a great mix. This is looking so great! I can't wait to see more of it together. It's hard for me to just pull random blocks and sew them together. I love scrappy, but find myself needing it to be a little more "controlled scrappy"! I can't wait to see this one finished. I love scarps and know it's going to be great. I have 9 scrap bins right now and some scraps that aren't in bins and for a minute I was really tempted. Just don't know where I'd put them! That is a great offer. I do have Paypal and here is my email address. nplyman@yahoo.com Nancy P.
Well done Candace for persevering with all those blocks. I am curious about how it will look. 2014 is the year where I will try to use more from my scrap hamper. I do NOT need your scraps. . . LOL. . .I have a ton of my own. But you have given me a great idea of what I could do with my scraps! I will be watching to see what develops with your blocks; I love the look of them so far! If I added your scraps to my scraps, I think I would here- "WHAT ABOUT ME" coming from my scrap bins!! I do like the block, and am waiting patiently to see the finale. I'm trying to think of a block I could do with my scraps now. Such a good idea. The snow's history and I hear the yellow-headed and red-winged buntings outside. Those are good signs of spring! I planted some herbs in my kitchen window. Let's get this season switched before it changes its mind! Congrats on getting rid of all the scraps. Great idea. Mine just linger in a drawer that is getting harder and harder to close. Wow, that's a lot of sewing you did. Can't wait to see the finished quilt. That is going to make an awesome quilt. I love the first row of your quilt, this is going to be a nice one. Great job getting rid of the scraps (& other goodies)! Love, love, love your blocks, they are so cute. That will be a beautiful quilt. What size are the blocks? Is there a block pattern you followed? Have fun putting this together! 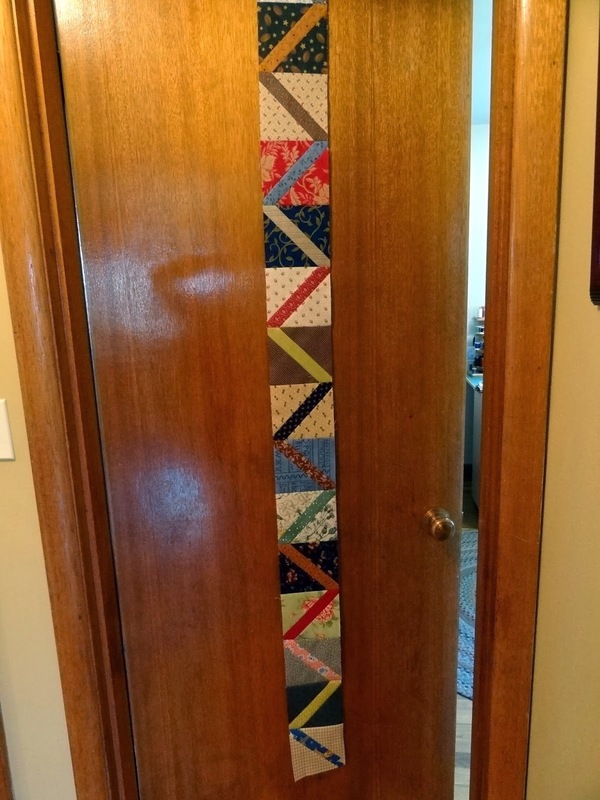 Just goes to show how quilters love scraps. Good for you for sharing! looks like that is going to be a big quilt!